Tonight on The Midnight Tracker, emerging from the sweet blue haze of time, we have a side from a record brought back into the light last month over on our companion blog. While digging at one of our local indie record stores not too long ago, I came across “Dinner Music,” an LP by the Buoys. Wondering what they sounded like once you got past “Timothy,” the 1971 single notorious for being about cannibalism, I picked it up for $1. As noted over on AM, Then FM, listening to the Buoys beyond “Timothy” for the first time, the five songs written by Rupert Holmes clearly foreshadow his stage music to come. Yes, Rupert Holmes, is the guy who did “Escape (The Pina Colada Song)” in 1979, but he also wrote “Drood,” a murder mystery/musical that won all kinds of Broadway awards in 1985. Holmes wasn’t in the band, though. He was a songwriter who worked with the Buoys — a group out of Wilkes-Barre, Pennsylvania — when they got a record deal from Scepter Records. Holmes arranged the entire LP, save for “Timothy,” but it isn’t clear whether he sings or plays on the record. Some sources credit Holmes as playing piano on the record, but its liner notes don’t say so. That said, “Dinner Music” is a remarkably sophisticated record for 1971. 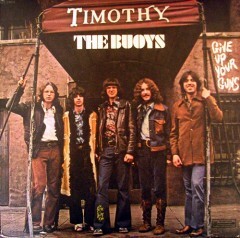 “Timothy,” “Tell Me Heaven Is Here,” “Bloodknot,” “Tomorrow” and “Absent Friend,” the Buoys, from “Dinner Music,” 1971. It’s out of print. This is Side 2. It runs 15:17. Holmes wrote “Timothy,” which you probably know, along with “Bloodknot” and “Tomorrow.” “Bloodknot” has the feel of something from a film score, perhaps from a chase scene. “Tomorrow” is a gentle but unremarkable ballad. The five Buoys — Bill Kelly (lead guitar and flute), Gerry Hludzik (bass), Fran Brozena (guitar and keyboards), Carl Siracuse (guitar, keyboard and flute) and Chris Hanlon (drums and percussion) — are tight, finding just the right grooves for a diverse bunch of songs. “Tell Me Heaven Is Here,” one of their songs on this side, seems inspired by Crosby, Stills, Nash and Young. The other, “Absent Friends,” is a solo vocal and acoustic guitar piece by Kelly that has a bit of an early prog feel to it. This entry was posted on February 17, 2014 at 6:12 pm and is filed under February 2014. You can subscribe via RSS 2.0 feed to this post's comments.